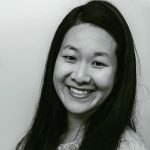 Published Oct 15, 2017 Updated Dec 6, 2017 By Julia 169 CommentsThis post may contain affiliate links. 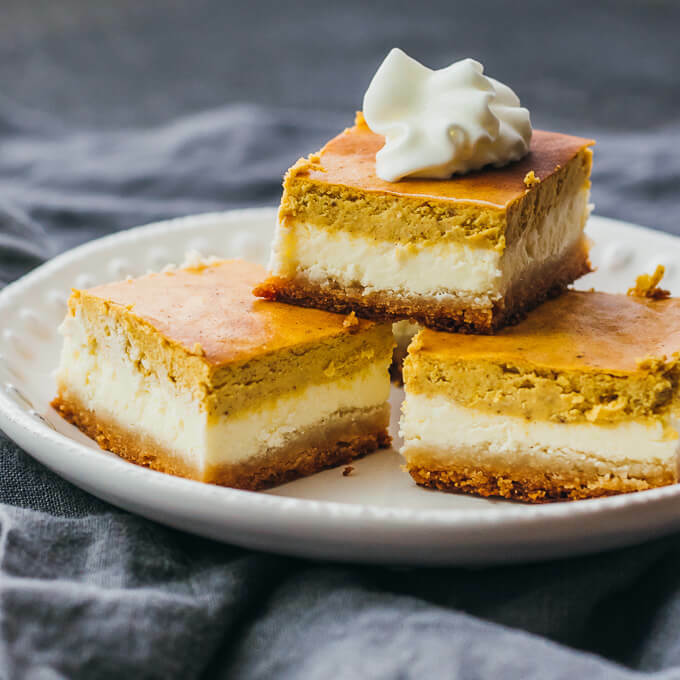 These healthy pumpkin cheesecake bars are layered with a bottom almond flour crust, a middle cheesecake layer, and a top pumpkin layer. Low carb, keto friendly, and gluten-free. 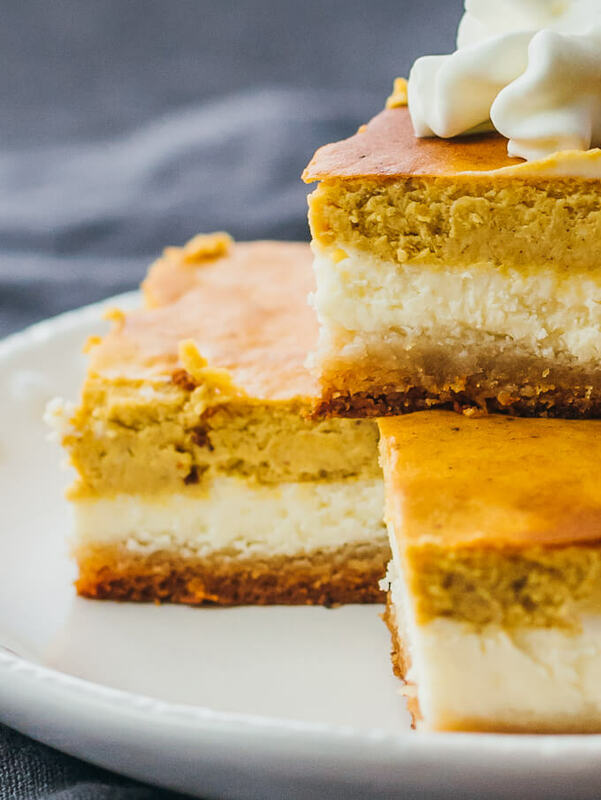 These dessert bars represent the best of both worlds — part pumpkin pie and part cheesecake, so you can get both flavors in a single bite. They’re perfect for people who consider pumpkin pie to be a bit too strong on the pumpkin flavor (that’s me), as the cheesecake layer helps to offset the pumpkin. The bars have a dense texture with a sturdy almond flour crust on the bottom, a thick and rich cheesecake layer, and a lighter pumpkin layer on the top. The bars are not too sweet, and are very low in carbs with only 2.5 g net carbs and 230 calories per bar. Even people who are not following any particular diet will love these bars. They store well when covered in the refrigerator and are ideal for snacking throughout the week or for a holiday party during Thanksgiving and Christmas. 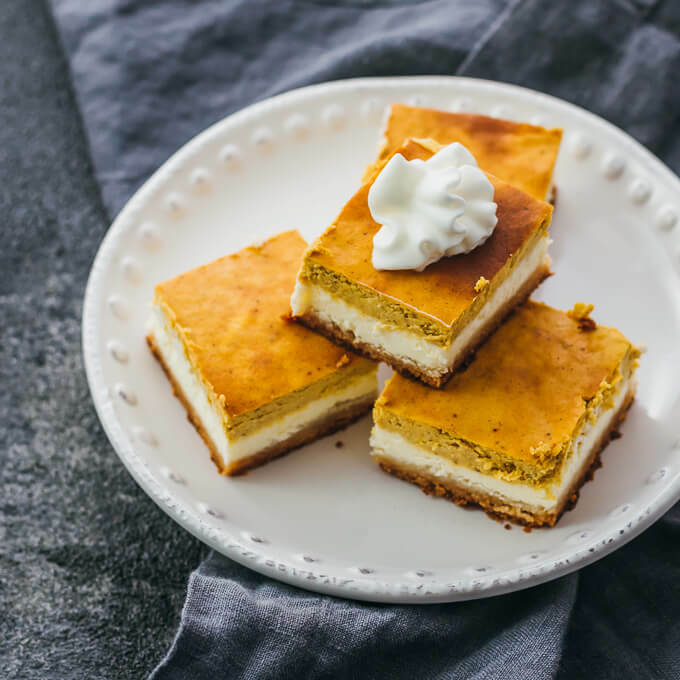 These pumpkin cheesecake bars were developed using snippets from previous baking experiments. For the crust, I have been testing a simple low carb crust using almond flour and butter, which works fantastically well for any recipe that calls for a generic pie crust. The cheesecake layer is a typical cheesecake filling inspired by my mom’s classic cheesecake recipe, and I substituted a low carb sweetener, erythritol. For the pumpkin layer, I mixed in canned pumpkin puree and typical pumpkin pie spices such as cinnamon, ginger, and cloves. Test subjects for these bars included Mr. Savory Tooth and his parents, who were in town at the time. I was originally inspired to make these bars after spotting a similar concept on allrecipes. I recommend taking the cream cheese and eggs out of the refrigerator in advance. They are much easier to beat and to incorporate into the filling when they are at room temperature, resulting in a silkier and smoother filling. See the above photos to get an idea of what the layers’ texture should look like. If you’re in a pinch and forgot to soften the cream cheese, you can microwave it for 10 seconds at a time until soft. I use the low carb sweetener erythritol because it cannot be digested by the body and has no effect on blood sugar or insulin. I recommend using the powdered version rather than the granules because it’s more easily combined into the filling. If you have the granulated kind, you can use a Nutribullet to pulverize into powdered form. 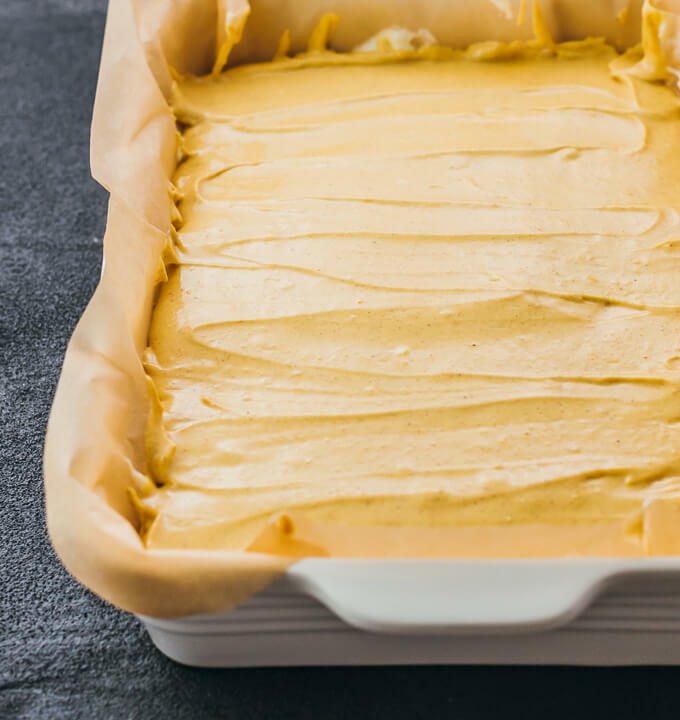 To determine when the cheesecake is “set” and ready to take out of the oven, give the baking dish a gentle shake or nudge and watch how the surface of the cheesecake moves. If the surface jiggles as a whole (think jello), then the cheesecake is set. If the surface doesn’t move together as a whole, and instead the center appears to be liquid-like, then the cheesecake is not set. Another option is to use a thermometer and remove the cheesecake when the center reaches 150 F. Note that cheesecakes never firm up in the oven — the hardening occurs when the cheesecake cools down. Ovens can vary significantly, so regularly monitor the cheesecake as it’s baking and remove from the oven once it sets. 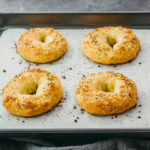 I’ve tested this recipe at various oven temperatures ranging from 350 F to 400 F, but if your oven runs on the hot side then I recommend baking at 350 F or lower. Leftovers are easy to store — cover and place in the refrigerator, where they will last up to a week. I recommend making these bars ahead of time, as they are best after they have hardened overnight in the refrigerator. Prepare a 9x13 inch baking dish and line the bottom and sides with parchment paper. Combine melted butter and erythritol in a mixing bowl, and stir together. Add almond flour, stirring until incorporated. Transfer the mixture to the baking dish. Press down along the bottom of the dish to form a flat and smooth crust. Bake the crust for 15 minutes at 300 F. Remove the crust from the oven and let it rest for 10 minutes while you work on the filling. Combine cream cheese and erythritol in a large bowl. Use a hand mixer to beat on low speed until light and airy. Add eggs one at a time, beating them in until combined. The resulting mixture should be very fluffy and airy. Transfer about half of the mixture over the crust, spreading it out evenly -- this becomes the cheesecake layer. Combine the remaining mixture with pumpkin puree, cinnamon, ginger, and cloves. Beat until smooth. Carefully scoop a small amount of pumpkin mixture over the cheesecake layer. Repeat to evenly distribute the pumpkin mixture over the cheesecake layer. Use a rubber spatula to spread out and smooth the pumpkin layer. Bake at 350 F until set, about 50 minutes. Ovens can vary so it may take you more or less time; frequently monitor the cheesecake and remove when done. Let the pumpkin cheesecake cool, and then refrigerate overnight to harden before cutting into it. To serve, slice into bars and optionally top with a dollop of whipped cream. This recipe yields 2.5 g net carbs per serving (1 bar). Nutrition information does not include erythritol, which cannot be digested by the body. The crust recipe doesn’t seem to be big enough for the pan…ends up an extremely thin layer. Is that correct? I ended up using an 8 x 8 square pan and then using half the cream cheese recipe to adapt. Thanks for your input. Can you double check your measurements for the crust’s ingredients? It should not be extremely thin. These bars don’t use sugar; they use a sugar-free sweetener. If you meant skipping sweeteners altogether, I wouldn’t recommend that because cheesecake without any sweetener tastes quite bad. I made these at Thanksgiving and they were wonderful!! Thank you! I’m hoping to make these for Christmas…. If I omit the pumpkin and just add eggnog spice…. Would it have enough moisture? The pumpkin puree adds a lot of volume compared to just eggnog spice, so I don’t think that would work out because you would end up with a really short cheesecake. Might be hard to do layers with that. These were a huge hit at Thanksgiving! Any recomendations for a Christmas flavor variation to the pumpkin? I’m wondering the same thing. I think I may omit the pumpkin and add eggnog spice instead? I must say that these were just so ding dang delicious!!! I’m not a fantastic baker but you upped my street cred with these babies! If we were wanting to up the pumpkin level in these, could I just add more pumpkin or would that mess with it setting up? 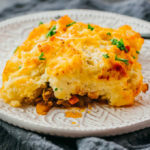 Thank you for your input and for sharing this great recipe!! I’m glad to hear you enjoyed them so much, Maria 🙂 I don’t recommend adding more pumpkin puree because then the top layer wouldn’t hold its form well — might get too soft. For more pumpkin flavor, I’d add more homemade or store-bought pumpkin spices. These are terrific. I love the simple crust, and they truly are better when refrigerated overnight. Even my family who are not gluten free enjoyed them. Does this really call for 32 ounces of cream cheese? The cream cheese squares are only 8oz each. Right, so you use 4 bricks of cream cheese. I just made this for tomorrow and I’m worried about wether or not if needs more time in the oven? I did 350 for 50 minutes, and it’s still pretty jiggly, but also very cracked all over the top. Not sure where I went wrong here… Any insight? Should I do more time in the oven or just pray it finishes setting in the fridge? Sounds like the cheesecake is set, so I would cover and refrigerate it overnight. Have you ever tested your oven’s temperature with an oven thermometer? Also, if you’re not doing so already, I would use a middle or lower oven rack so that the cheesecake is baking in the center of the oven. Do you think I could make these in muffin tins? Yes, that would work. You’ll have to adjust the baking time accordingly. I find it hard to believe that this recipe calls for 8oz of pumpkin puree for a 9×13 dish. Is this a typo or is this correct? puzzled. It’s not a typo. The top pumpkin layer isn’t just pumpkin; it also has cheesecake batter. Can I substitue the erythirol sweetener with another type…truvia or stevia and if so what would the ratio be? Erythritol is about 70% as sweet as sugar. How does your preferred sweetener’s sweetness compare to sugar (check its packaging)? With that information, you can make the conversion to figure out how much to use. Note that I use powdered, not granulated. You’re using erythritol, not an erythritol blend like Swerve or Lakanto, right? If so, yes I recommend powdering it because it affects the provided volume measurements and erythritol granules are on the larger side. 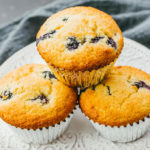 The larger granules don’t mix into the batter as well, sometimes resulting in crystallization and a cooling “crunch.” You can powder it using a small blender. Can I do this without the parchment paper? I assume the prch paper is for easy removal if you’re cutting into bars before serving (like in the lovely pics of bars above). I’d like to leave in the baking dish & serve sorta like a cake or cobbler. That makes sense. Might still be good to grease the baking dish. Use a cooking spray or rub some butter along the bottom and sides.